Berlin’s new Future! Publish event was the setting for a keynote from HarperCollins’ digital chief Chantal Restivo-Alessi. A voice of reason amid recent “print resurgence” hosannas, HarperCollins’ Chief Digital Officer and Vice President of International, Chantal Restivo-Alessi gave the keynote address at the Future! Publish conference event, which was staged in Berlin on January 28 and 29. Focusing on “mindflow,” workflow and networking, the program was produced by a partnership including the German Booksellers and Publishers Association, Frankfurt Book Fair, Forum Zukunft, and MBV. 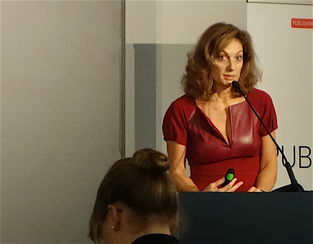 Our friends at Buchreport have produced very useful Q&A for Buchreport’s Pubiz with Restivo-Alessi based on themes from her keynote address, and we’re glad to have Michael Lemster’s conversation with her. 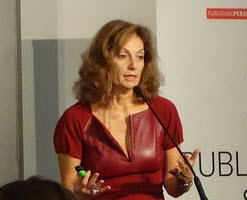 During her keynote, Restivo-Alessi told her audience that the recent slowdown of growth in the ebook market is a normal, transitional phenomenon, and that backlist stands to benefit particularly well from digital channels of distribution—certainly something that Jane Friedman’s Open Road Media is proving as it expands into powerfully presented verticals across its more-than 10,000 backlist titles. As many of the best digital directors in our largest houses might tell you, one of their jobs becomes evangelizing for the importance of digital as a pervasive dynamic, touching, as Restivo-Alessi said in Berlin, all areas of publishing, with international markets a natural for coordinated content marketing. I encourage you to read Lemster’s interview with Restivo-Alessi, and I’ll just touch on a few highlights here. “We believe, and have seen in numerous studies to date including those about younger consumers, that the printed book will retain a very prominent role in the way consumers experience long form story telling. The positive message is that consumers still appreciate the print book for many of its tactile qualities as well as for the ability the book gives people to show their knowledge and taste. “In the spirit of servicing our authors, we believe that our global publishing program gives us the opportunity to service the authors who decide to participate in it, in a unique way. “As I mentioned in the course of my presentation, consumers live in a hybrid world, so it is absolutely vital to stick to a digital agenda. “Seeing a slow down in growth is normal in any new product introduction, nothing grows forever, and additionally, at least in the US, we are in year of business model transition. However, it is clear, that from a product stand point, digital is here to stay – and that consumers have adopted this product. 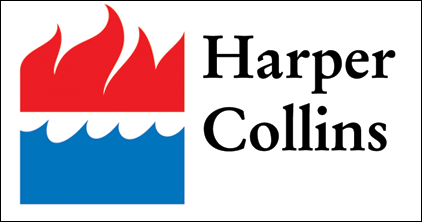 As it happens, we have more from HarperCollins today, in a lead story and sidebar on the Avon Romance imprint, a sister to Harlequin. Read about that here and here.